Depart DublinWe depart Dublin @ 08:00, driving through the midlands down to Blarney, in the beautiful County Cork. We will pass through the Golden Vale, the most fertile lands in all of Europe with green fields as far as the eye can see. We get great panoramic views of the Galtee mountains, as we pass through County Tipperary down to the southern County Cork. Rock of CashelOur first stop will be the world famous Rock of Cashel in Co. Tipperary. One of Ireland's most evocative sites, you can stroll in the footsteps of St. Patrick flanked by ruins, Celtic crosses and round towers. Feel the soul of Ireland. The Rock of Cashel was the traditional seat of the Kings of Munster until they donated the complex to the Catholic Church almost 1,000 years ago for use as a cathedral. One of the best examples of medieval architecture anywhere in Europe. Your entrance fee (EUR 7.00) is included in the price of this tour. Cork CityEnjoy one hour and thirty minutes at leisure in Cork city, Ireland's southern capital. Highlights include the gourmet English Markets (1788) with a large selection of food stalls representing the best of local produce. Queen Elizabeth II of England thoroughly enjoyed meeting local artisans here on her State Visit in 2011! Also known as the “Rebel City” for its fierce resistance during the War of Independence, Cork has a vibrant Irish atmosphere. Perhaps sample a pint of Murphy's Irish Stout or pick up a bottle of Paddy Flaherty Irish Whiskey. Blarney CastleFamed in song and story, the Irish are famous for the “Blarney”. Kiss the Blarney Stone and you too will receive this “gift of the gab” - 7 years of eloquent speech. 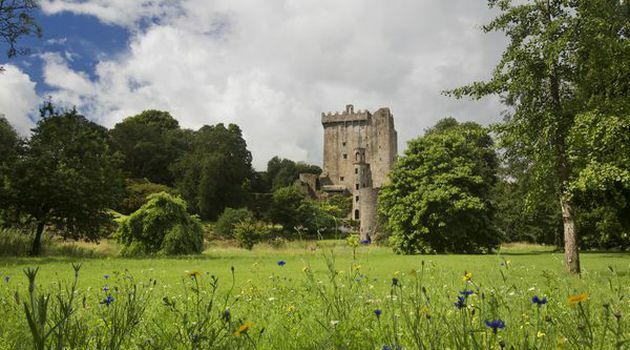 Situated on the battlements of Blarney Castle you will have to bend over backwards to kiss the stone! You have time to enjoy a stroll around the fabulous gardens of the Blarney Estate or maybe enjoy the beautiful Lake Walk. We also visit the Witches Cave in the castle grounds before having plenty of time to indulge in the tax free shopping haven of the Blarney Woollen Mills and craft shop. Your entrance fee (EUR 13.00) is included in the price of this tour. DepartureTour ends in Dublin approx. 20:00 in time for evening entertainment.